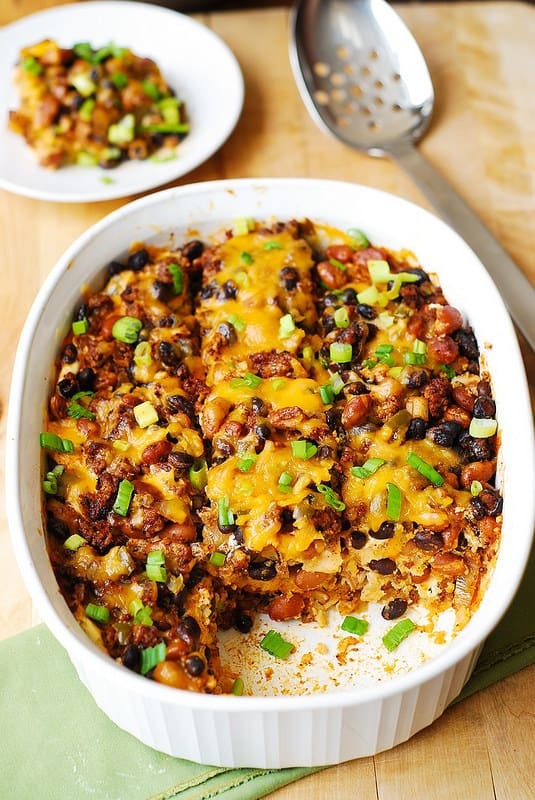 Black Bean and Beef Enchilada Casserole (with pinto beans, black beans, green chili peppers, cheese, and green onions) – quick and easy-to-make dinner, great for leftovers! 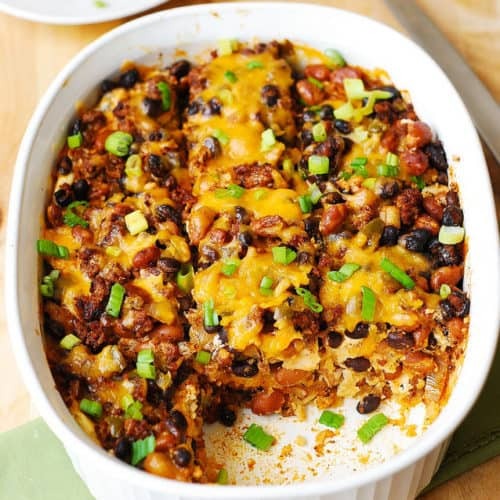 This enchilada casserole is gluten free as it is made with corn tortillas and gluten free enchilada sauce. 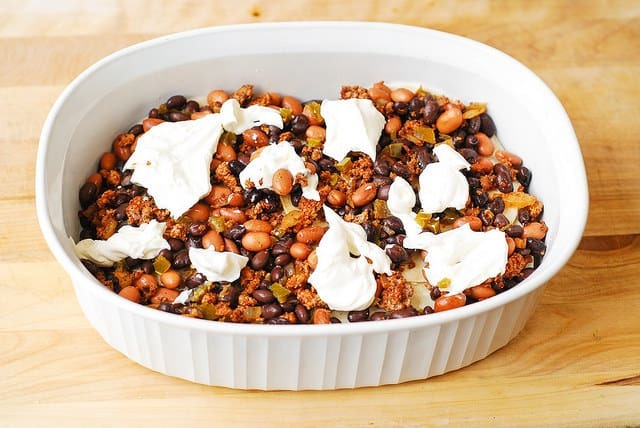 I have a weak spot for casseroles and make them quite often: they are so easy to prepare and assemble, as long as you have all of the ingredients. 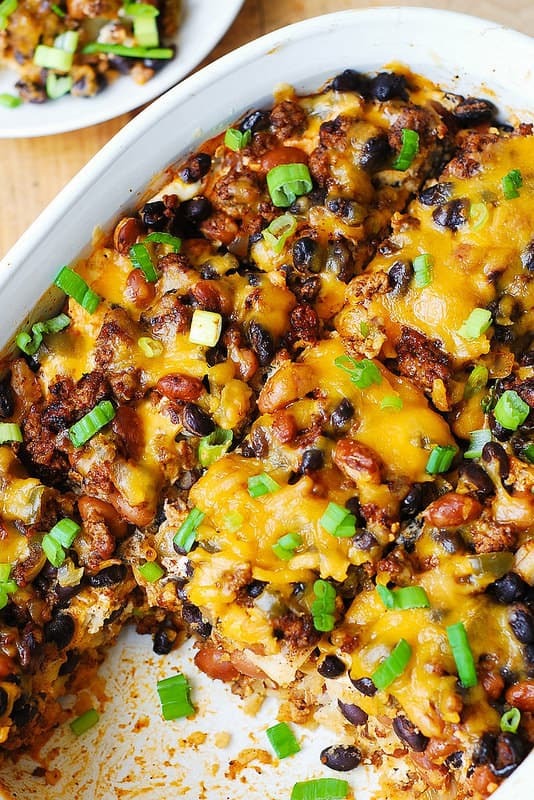 This black been and beef enchilada casserole dish is full of Mexican, Tex-Mex, Southwestern flavors – it’s a great family recipe with lots of flavor, without being overly spicy! 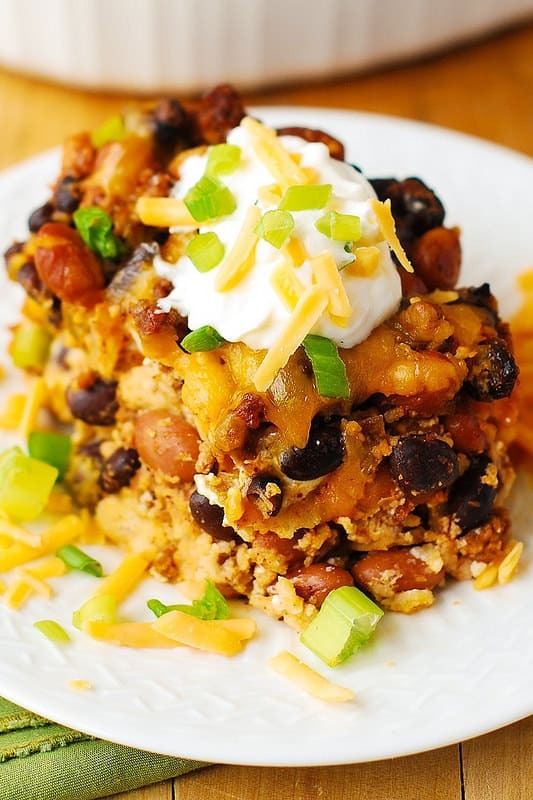 I love making casserole dishes with corn tortillas and this one is no exception! Using corn tortillas makes this a gluten free recipe! While you can assemble this dish and cook it right away, it can also be refrigerated and cooked the next day – which is perfect if you need to prepare a dinner in advance and don’t want to rush the next day! I made this enchilada casserole in 2.8 L (3 quart) baking dish, which produced a generous number of servings, at least 8! 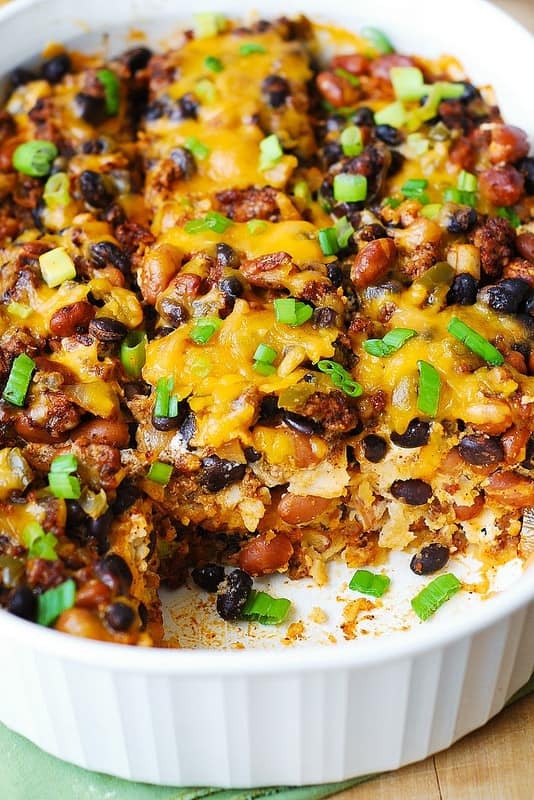 You can feed a lot of people with this casserole, or save it for leftovers. 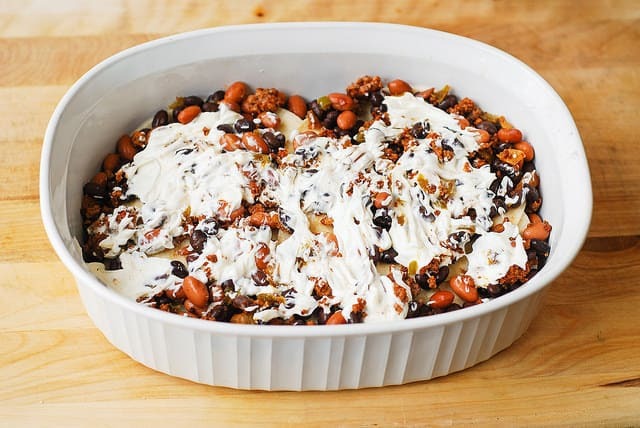 Below, I have step-by-step photos on how to assemble this black bean and beef enchilada casserole dish – it’s very easy and didn’t really require any step-by-step pictures, but I did them anyway. The step-by-step photos are for the first layer, remember to repeat it 3 times as you have 3 layers in your casserole dish. Also, for the final layer, I reversed the order of beef mixture and sour cream, by adding sour cream and enchilada sauce first, then the remaining beef mixture with cheese on top. That made for a very nice presentation and one good looking meal! Assembling the casserole. Remember to repeat these steps 3 times, for 3 layers. 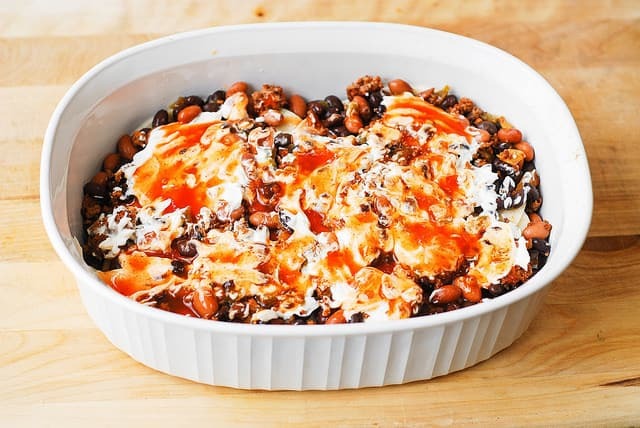 NOTE: For the final layer, reverse the order of beef mixture and sour cream, by adding sour cream and enchilada sauce first (over the tortillas), then top the sour cream and enchilada sauce with the the remaining beef mixture with cheese on top. Bake at 375 F for 25 minutes covered, then remove foil, top with shredded cheddar cheese, and bake for 10 more minutes uncovered. 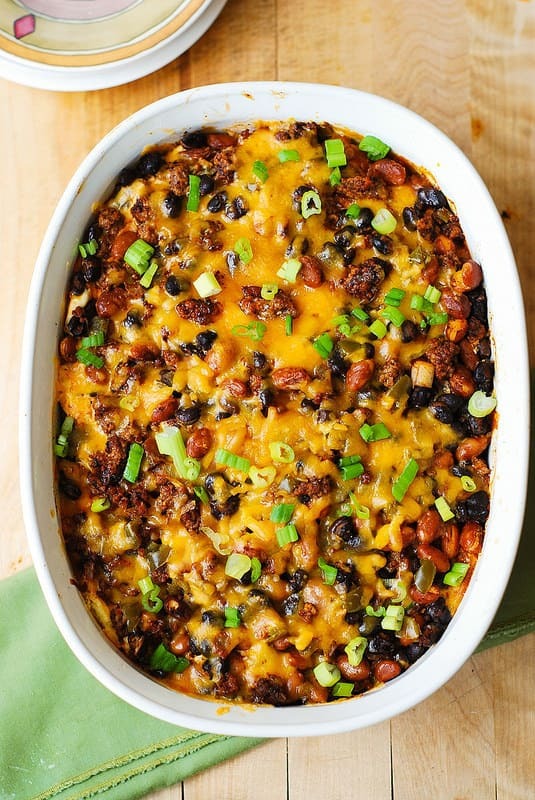 Black Bean and Beef Enchilada Casserole with pinto beans, black beans, green chili peppers, cheese, and green onions - quick and easy-to-make dinner! 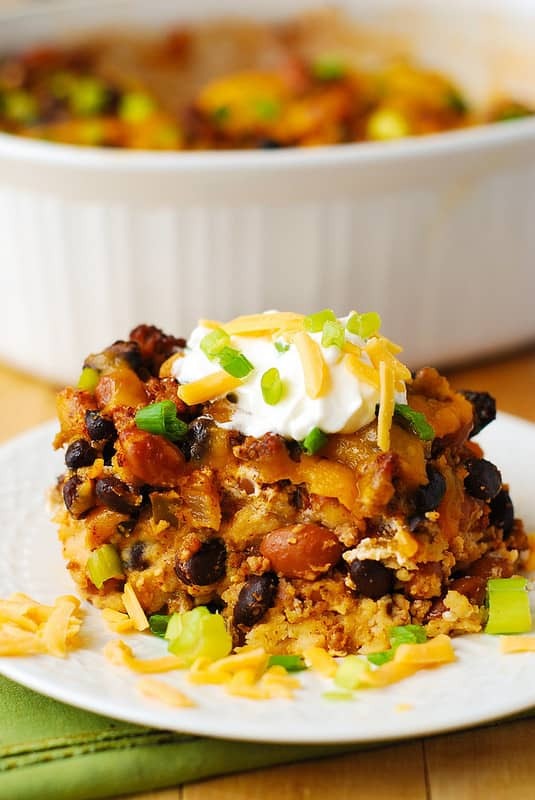 This enchilada casserole is gluten free as it is made with corn tortillas and gluten free enchilada sauce. 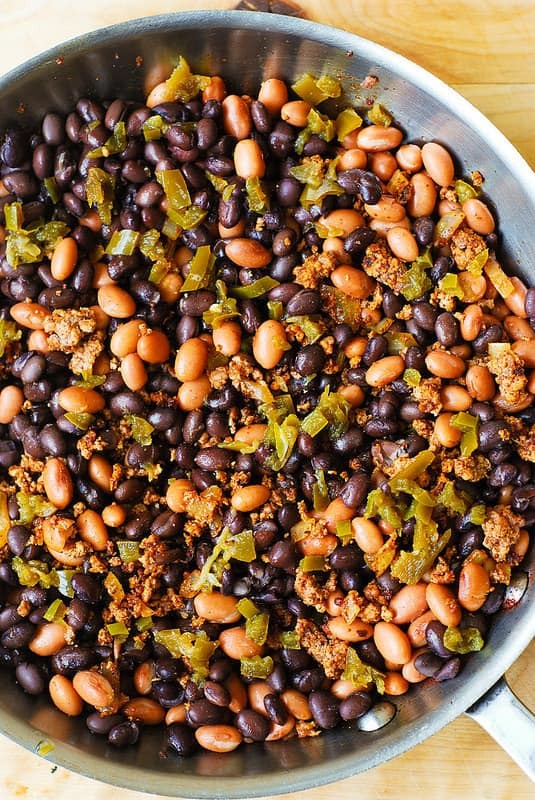 This recipe is full of Mexican, Tex-Mex, Southwestern flavors! 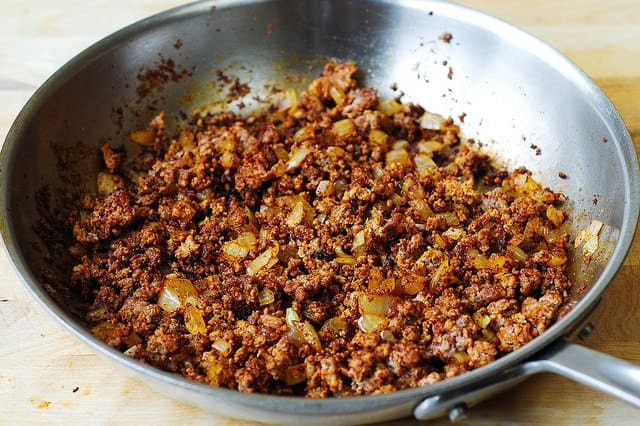 In a large skillet, on medium-high heat, cook the ground beef, chopped onion until meat is no longer pink, drain all the fat/liquid from the pan. Add chili powder, cumin, and 1/4 teaspoon of salt into the meat mixture and cook, stirring for about a minute, to let the spices mix in and until onion is soft. 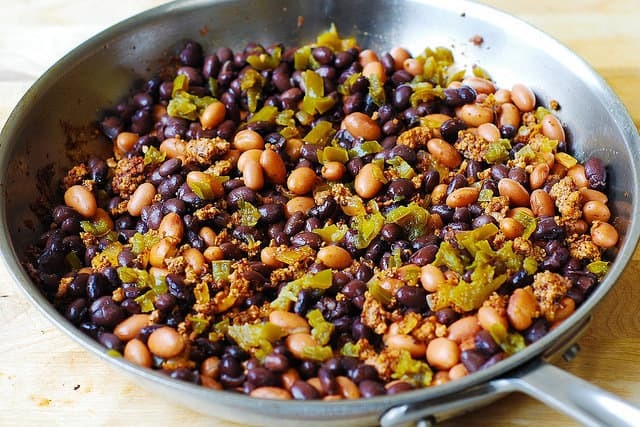 Add drained and rinsed black beans and pinto beans, and undrained chili peppers into meat mixture off heat. Taste the meat-bean mixture, and add more salt if needed. Add more chili powder or cumin, than indicated in the recipe, if needed. Set aside. 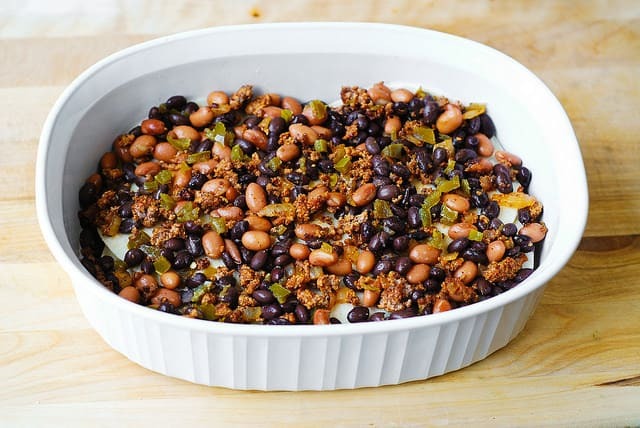 This is one of my absolute favorite Mexican casseroles! I am currently meal prepping for a friend expecting her little one any day now and wanted to know if this would be good in the freezer? Made it last night, but substituted the enchilada sauce with low sodium chunky salsa, and rinsed black beans only. Instead of using sour crème, I opted for Oikos greek fat free yogurt. I didn’t use any salt, other than cumin, cracked black pepper, and a bit of hot paprika. I omitted the green chili but topped the final dish wish a few shredded red radishes. Dinner for two….it was a hit and delicious. So glad you liked this recipe! Thank you for such a thoughtful comment! Thank you for sharing how you made this dish! 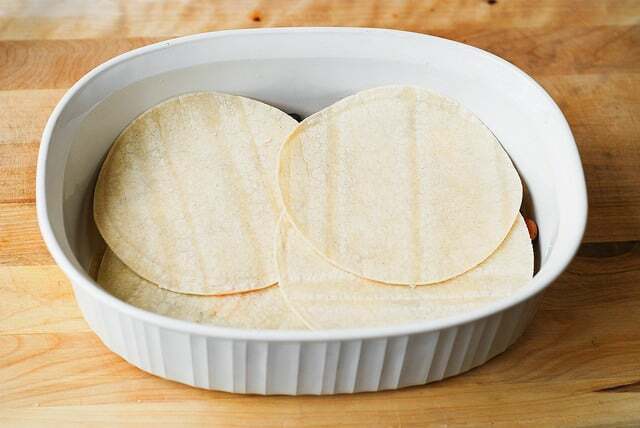 Could you make this with flour tortillas? Yes, you can! It won’t be gluten free, but the recipe will certainly work! I made this, but substituted 1 lb. ground chicken for the ground beef. I used 15 ounces Enchilada sauce due to ground chicken being a bit drier than ground beef. My teenage son is a very picky eater. He had 2 servings and said this is definitely a keeper. My husband really liked this also! So happy to hear your family enjoyed this dish! Thank you for leaving your wonderful feedback! I made this tonight and it was soooo good!! The only thing I add was queso fresco cheese in each layer and on top. Really rich! I served with lime wedge and shredded lettuce. Glad you liked it! Adding freshly squeezed lime juice and fresh chopped cilantro sounds delicious! Yes, there are a lot of improvements that have to be made to my recipes. can you make a day in advance and store in fridge? Yes, you can definitely make this in advance, cover it air-tight, store it in the fridge, and then cook the casserole the next day. Good, tastes more like chili than enchiladas. 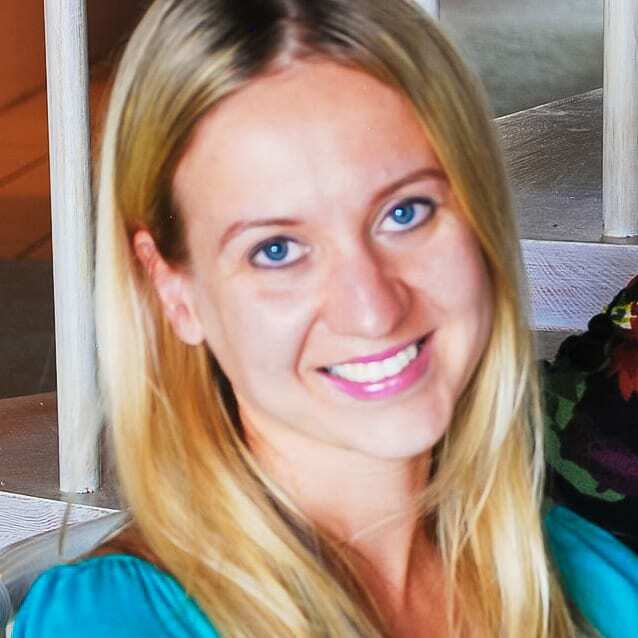 Thank you, Julie! I am glad you enjoyed it! I’ve made this a few times, and add drained corn to it to kick up the flavor a notch. I also use 12oz of enchilada sauce with it, Great recipe! Thank you! Adding corn sounds delicious!